Disclosure; This is not a sponsored post. I did receive a product sample to facilitate my review however the opinions here are my own. Ever since nursery school I have been a big fan of wooden toys. 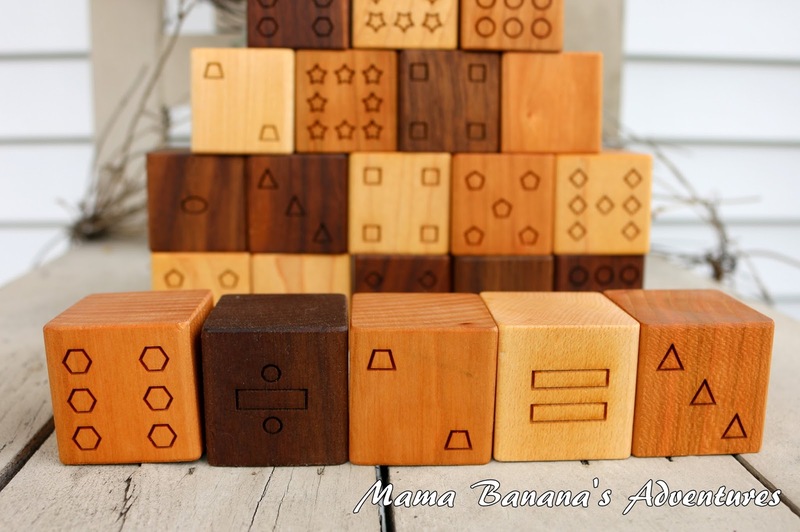 Many years later, I still remember playing with the classroom’s well loved set of wooden blocks. Triangle blocks, cylinders, squares…all the tools needed for an active imagination. 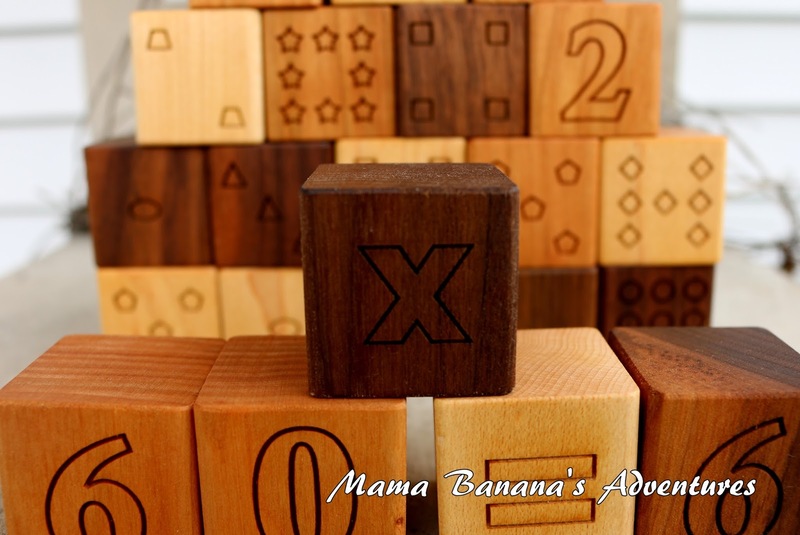 Now, as the proud Mom to 3 (soon to be 4) boys I hope to give my children the same experiences with quality wooden toys. I have searched the internet, etsy shops, ebay, amazon…you name it, I’ve surfed there. Unfortunately, USA made high quality wooden toys can be hard to come across. We purchased blocks from Toys-R-Us and they have brightly colored paint and are made in China. To be honest, I don’t use them often. I nearly jumped for joy when I discovered Smiling Tree Toys. It’s a Mom and Dad run business that hand-makes their toys in Minnesota. Have a look at this fantastic company and like me, I’m sure you’ll want to have one of everything in your home! We have the opportunity to review these fantastic Math Blocks. 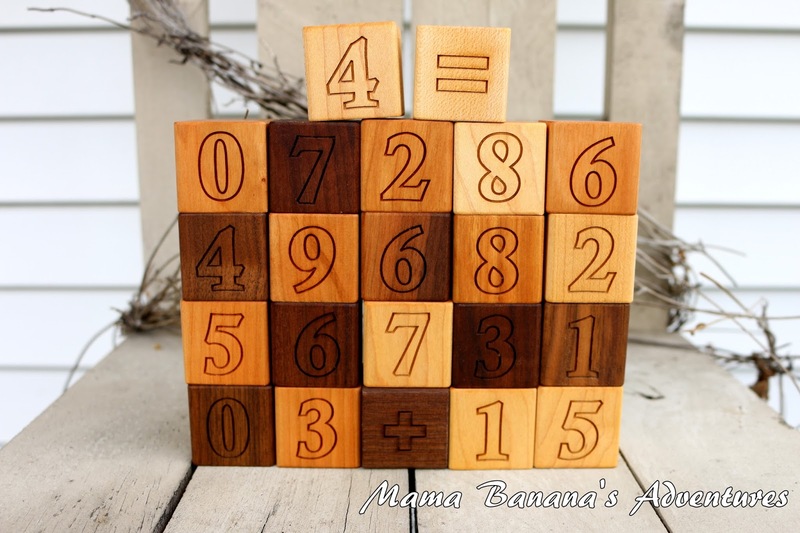 Smiling Tree Toys makes building blocks, alphabet blocks, personalized sets and keepsakes…but when I saw these math blocks I knew my 4 year old would have a blast! The blocks arrived in a white box, and as someone who reviews cloth diapers regularly, I was surprised when I heard the box rattle. I quickly opened it up to find an adorable unbleached cotton drawstring bag filled with these blocks. I thought my 4 year old would use them with his math workbooks…but they really inspire his imagination. When I first spread them out in-front of him, he lined up numbers 1,3,5,7,9 etc. and said “hey Mom look, it’s odd numbers.” We’ve talked a few times about even and odd numbers…but I didn’t know he had remembered! He makes up his own math problems, uses them to teach his younger brothers and is very interested in division and multiplication. He’ll engage with them for 30-45 minutes on his own. What an amazing learning tool, all from blocks! On one side of the blocks (seen above) are numbers, on the same block on the reverse side are symbols. For example, on the “9” block there are 9 circles on the back. The zero block is blank on the back and the action block has an addition, subtraction, multiplication and division sign on it. It’s the darkest out of the bunch (nearly black) and very easy to find in the mix. The blocks are all different shades of natural wood and finished with organic oil and beeswax. They have a nice matte texture and are very smooth. I know that if our baby gets a hold of one, and tries to put it in his mouth, there are zero chemicals and paints he can ingest. Blocks are 1.5″ cubes and are a regular carry-along item in our to-go bag. They frequent Grandma’s! The color of the blocks in the photos with my son teaching his brother are most accurate compared to the lighter outdoor photos. The darker blocks are truly darker and they each have unique features that makes them easy to identify when they’re all in a pile. Given a little bit of time, it’s easy to identify each number block not only from the number…but from the individual nuances in the wood grain and color. What would I change about this product? I’m frequently asked to share a downside. My downside would be that I want more blocks!! 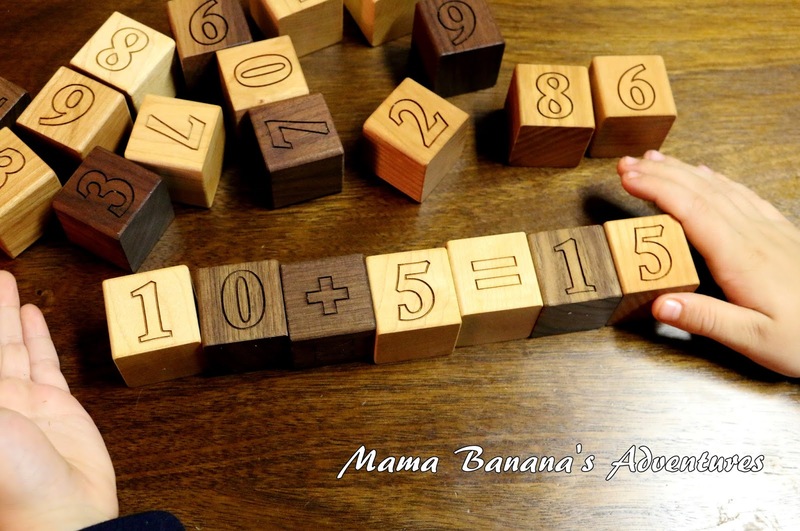 As my boys grow in their mathematical abilities, I would definitely want to add a second set to allow for bigger and more complicated math problems. This set, and many others on their website, would make a great gift and applies to a wide range of ages and abilities. Some tidbits about this company; Smiling Tree Toys is owned and operated by Mom and Dad team Justin and Kathleen in Minnesota. As parents to 2 babies they take pride in making handmade items, including children’s toys, that are earth friendly from start to finish. 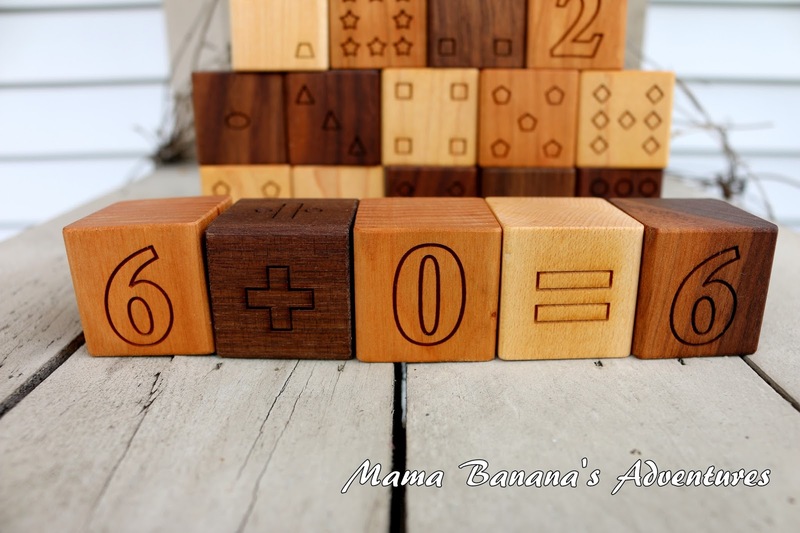 Products are made from sustainable American hardwoods and as you can see in the math blocks featured here, they add fantastic character to every piece. After spending 2 years in the Peace Corps in West Africa, their experience has lead them to a deep appreciation of life, and in return they donate a portion of their profits from every item sold to Peace Corps Youth Development Program. Want to learn more about this company? I highly recommend checking out their shop! 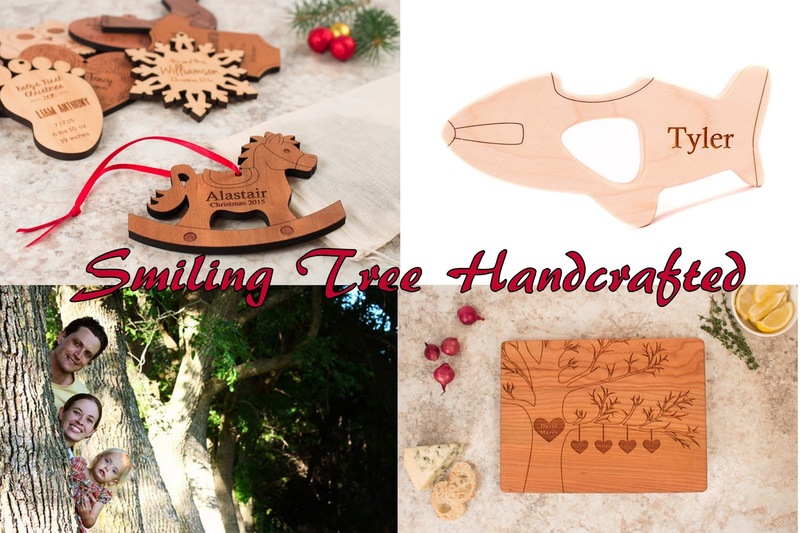 They create everything from Christmas ornaments to personalized cutting boards and baby teethers. Make sure to follow them on facebook and visit their website to see a HUGE selection of products. All of these are beautiful I can't wait to try some! Oh my gosh their personalized teethers are so adorable! I think my daughter needs one for Christmas. These are super cute! I will have to get my boys some soon. 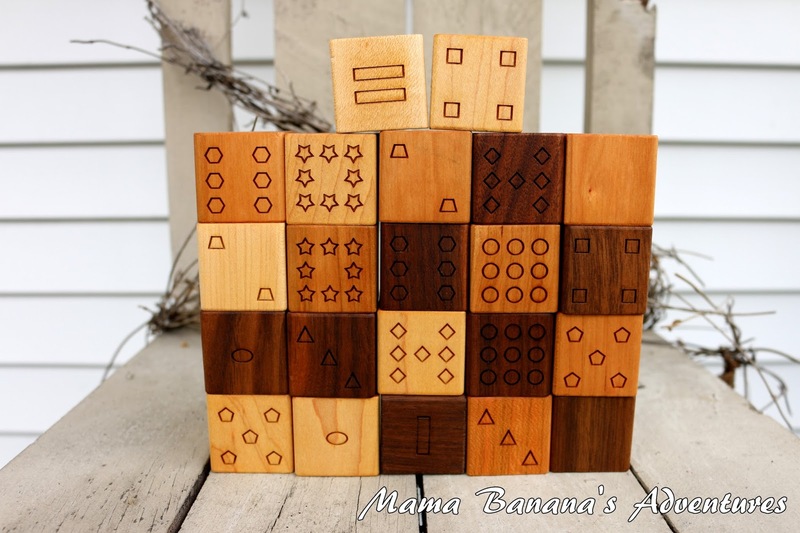 I am in love with these wood blocks made in the USA! What a touching and amazing story too! I too am highly disappointed by how many children's toys (pretty much all) are not made here these days, and made cheap. I can't wait to order my first set from them! I love natural wood products. The old-school truck on their website looks like the perfect present for my nephew. I love the personalized toys and ornaments! I could see the blocks being very useful for homeschooling. I love items made from natural materials! These are adorable. I love Natural toys like this. I love how I'm seeing a lot more handmade quality toys. I hate these cheap plastic ones. These are awesome I would love to get my son a set when he's older! We have some of their alphabet blocks and I love them! Such beautiful well made blocks and I love the different wood tones they use. 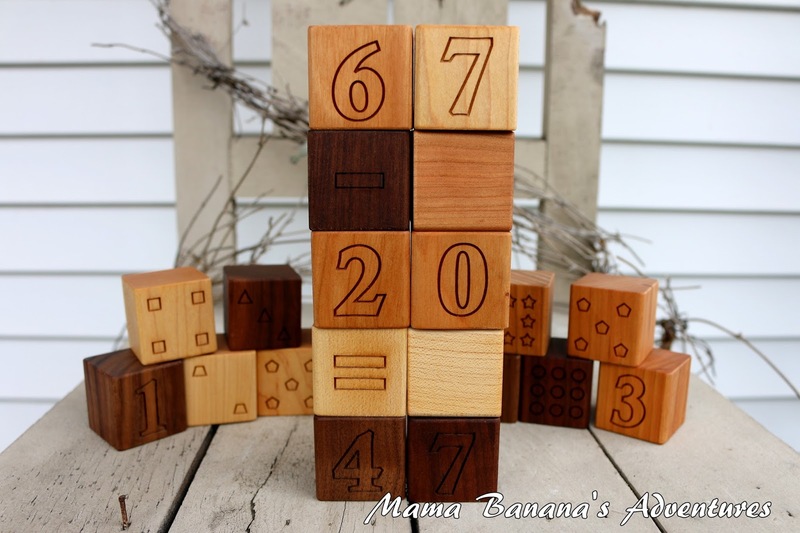 We would love to have some numbering blocks to go with them! I love wooden toys!! These blocks are beautiful! I have 2 little one's who would adore these! I am very interested in all their other items as well! You can't beat anything handcrafted! Theses blocks are so cute! Much prettier than the blocks I had as a kid growing up! I love wooden toys. They are very nicely made. I love these blocks!! Their toys are totally heirloom quality and would be ones that I would save for my son to pass along to his own kids someday. I love wooden toys. They are ever lasting and free from chemicals. Wow! I would love it if they made those little pull-along wooden toys that are like, ducks or train cars, or whatever, for kids to walk around pulling behind them- and I so so want the numbers blocks now! I love these!! Hands on manipulatives are the best for kids. My daughter would definitely grow into these! These are really gorgeous wood blocks. Sounds like a great company. Run by a mom and dad, made in the US, portion of profits get donated, natural and chemical free wood items. It all sounds great. I really like the number blocks and the Christmas ornaments. Wooden toys are so much safer then those manufactured in china but it's hard to find them. These are great and safe! Also very educational and a great learning tool. I love that they are paint free. I hate painted wooden toys. It just chips and I feel like a baby can swallow that paint. So glad I came across these! I get a little obsessed with trying to make sure everything or almost everything I bring into my home is non toxic. Everyone knows babies and kids out everything into their mouth and these can really put a mind at ease! Wow!! Gorgeous craftsmanship!! I love that you can tell love goes into every piece!! 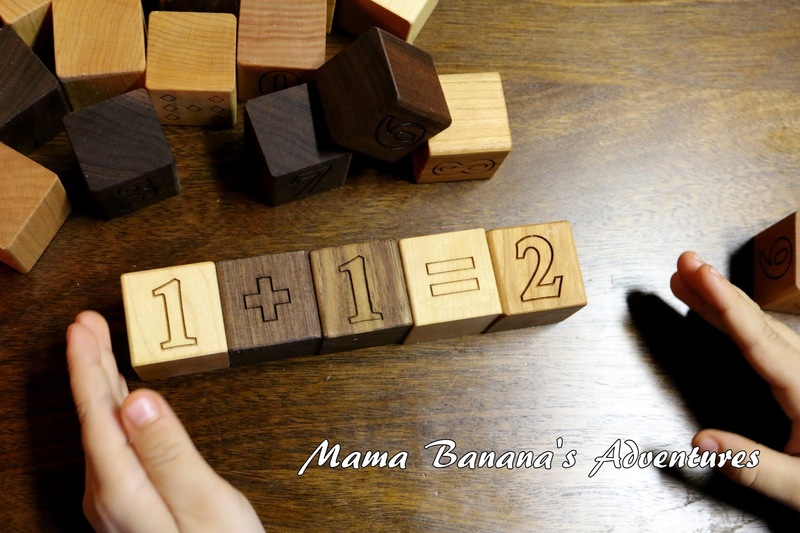 I love that the blocks can grow with your child and teach them math when they are older as well!! So fabulous! These are beautiful! I love that they are natural and free from chemicals. LOVE that these have useful number grouping rather than simple pictures. Could totally use these for my kiddos' math!